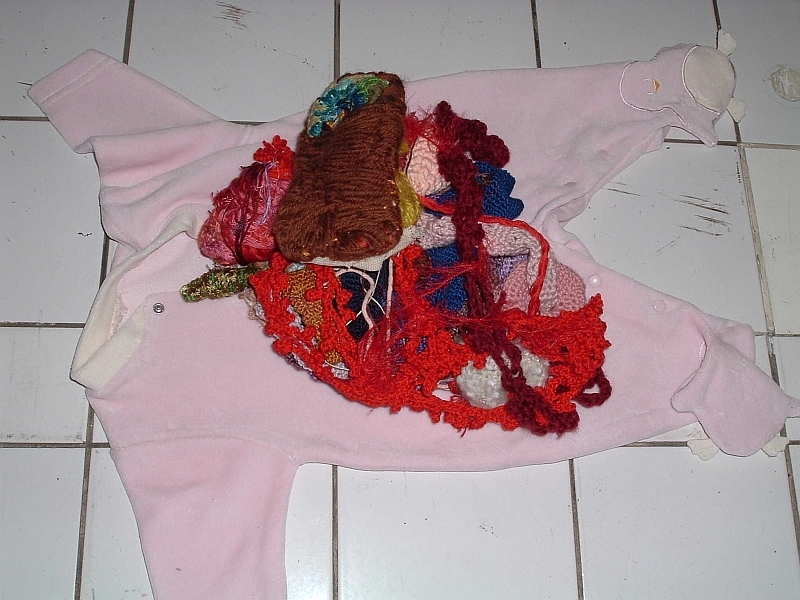 In 2001, Marijs Boulogne began what would later become the Excavations project with the creation of an embroidered dress for a baby who could not live. The dress was exhibited at the Nieuwpoorttheater in Ghent, and various art venues in Roubaix, France in Brussels and Leuven, Belgium. 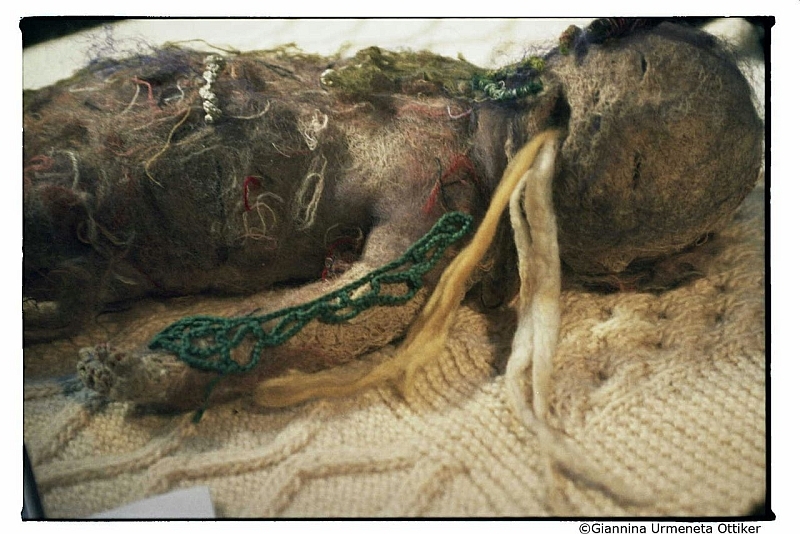 She embroidered a baby in different phases evolved from the birth to the death of the child. 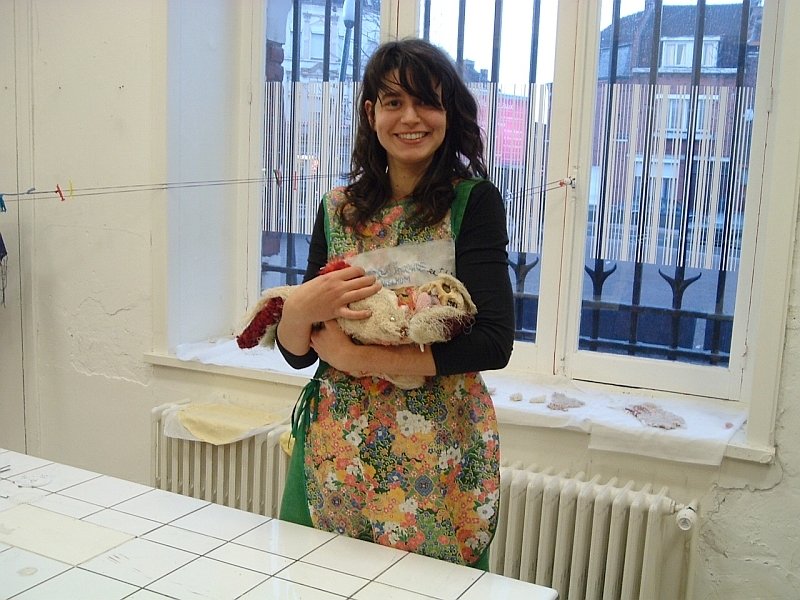 Step by step, she developed the baby through 7 stages: from pregnancy to naming the baby "Pas". Each stage of the project expressed itself in a new form of a performance. An impressive trail was made along several art centres and festivals. Various branches of art were discussed: embroidery, performance, conceptual art, video, music, theatre. The content was very layered and loaded with wisdom; the different phases were not clearly defined. The process was about repetition, retelling, reformulating, rethinking, redefining. 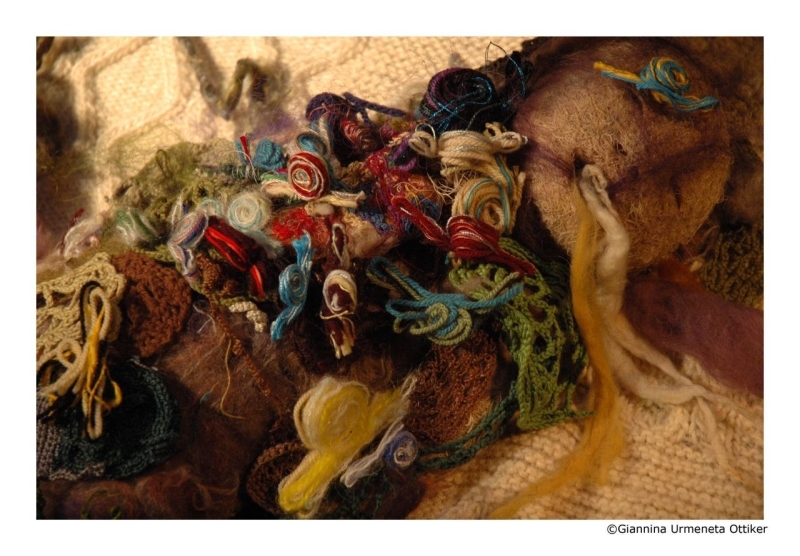 After crocheting for 3 months in Australia, 2 months in Italy, and 2 months in France, all the baby’s body parts were finally ready and every detail in every fibre was checked, before the embroidered puppet could be "born". Excavations took place in the venue La condition Publique in Roubaix, France during 4 days. 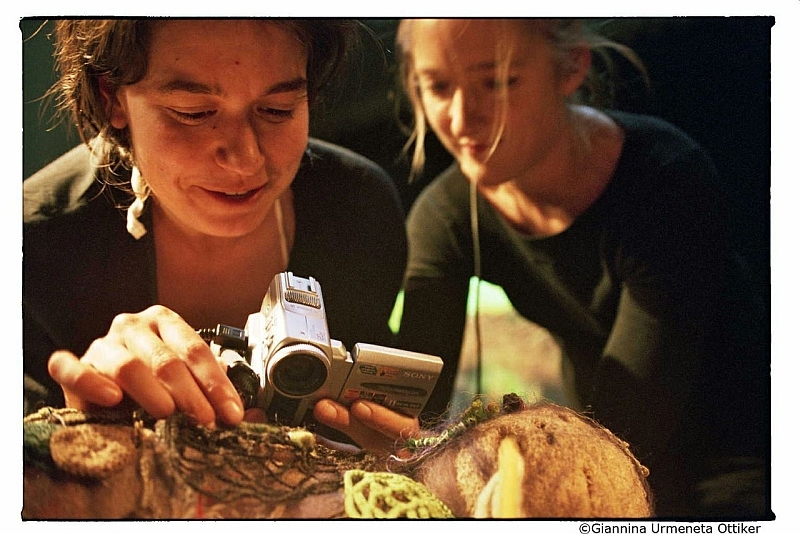 Together with her "assistants", the filmmaker Julia Clever and the dramaturge Veerle Herremans, Marijs Boulogne performed in three different languages at the Lille 2004 and Brussels Rits Outsider Art tour inside her “laboratory” set before of a freely moving audience. 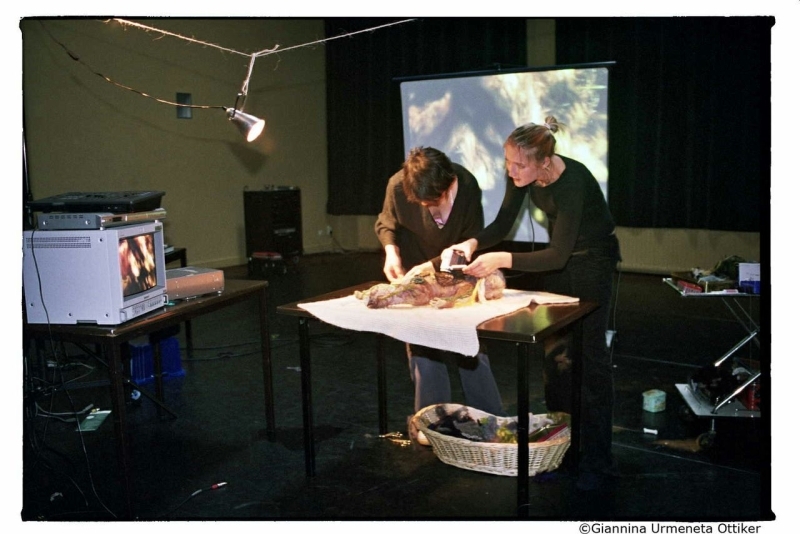 The performances were conceived as a system in motion; 4 hour long interactive shows, playing with visualization and the ways to talk about "what we see". There were no rehearsals, no memorized words, everything happened as it happened. 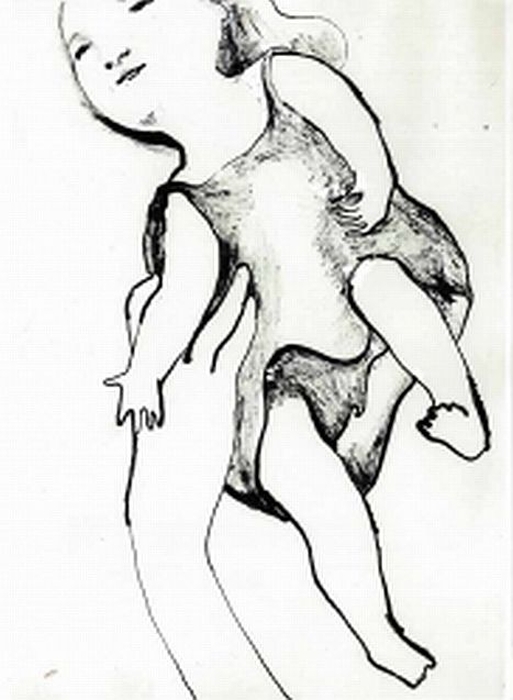 Excavations: Excavation, the baby came into the world via self-redemption. Marijs Boulogne performed an operation excising a little piece of mirror from her leg with a scalpel without anaesthesia. The mirror turned out to be a cyst and as such had to be excavated. The wound was sutured with three stitches. 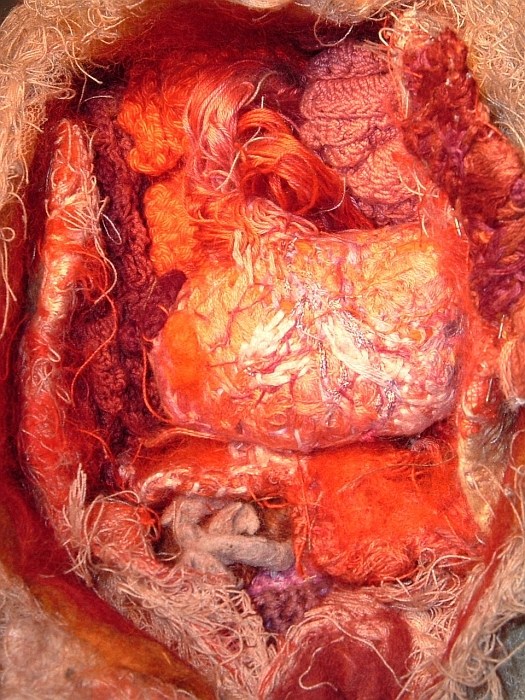 Her assistants (Veerle Herremans and Ragna Aurich and video artist Julia Clever) helped with good advice, held the wound open with crochet hooks, and kept everything sterile. After the wound was sutured with three stitches, the miracle healing was displayed with the delighted cries of the girls in the background. According to Marijs Boulogne, this video operation was perhaps a pubescent joke in a way. 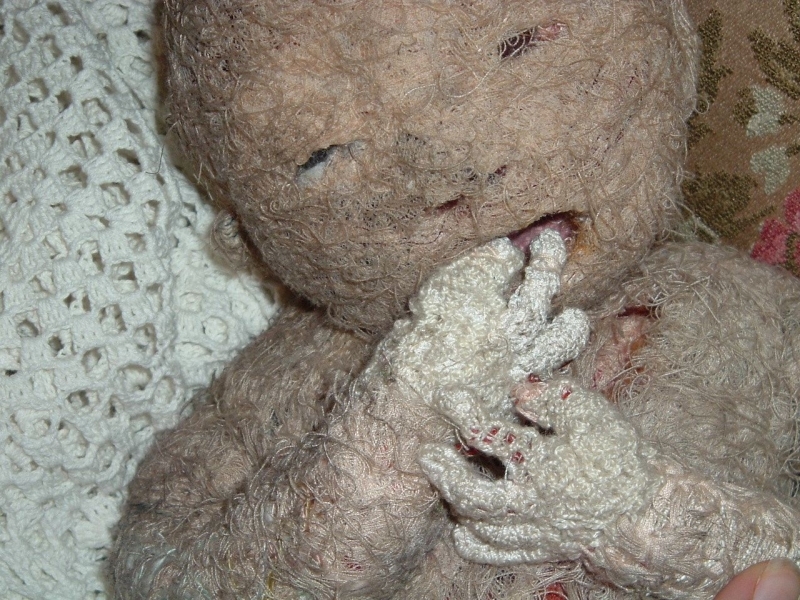 She felt the pain of the baby that could not live and she was in mourning, so she wanted to do something to visualise it in something which involved the control of mind over pain, in an operation of an ectoderm grown upside down and trapped somewhere in the mesoderm, which she performed without the use of anaesthetics. 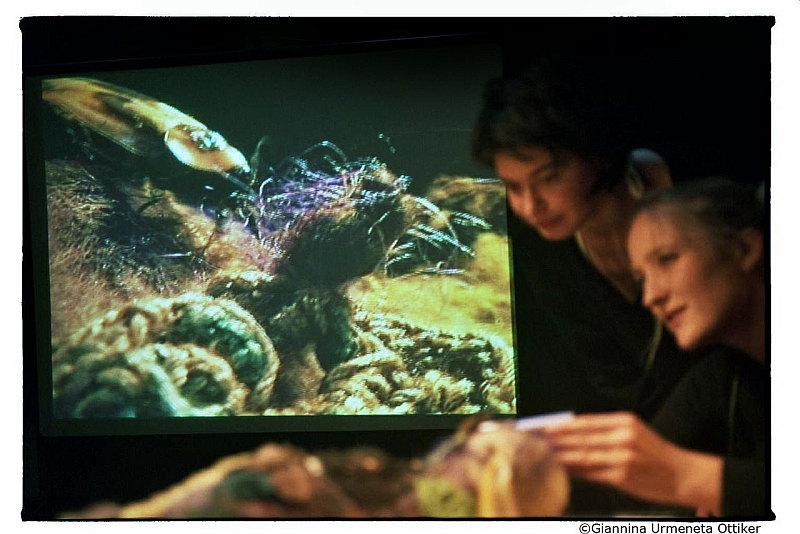 16-17 March 2005 - Nieuwpoorttheater, Gent, Belgium: performance video presentation and conversation with the audience. 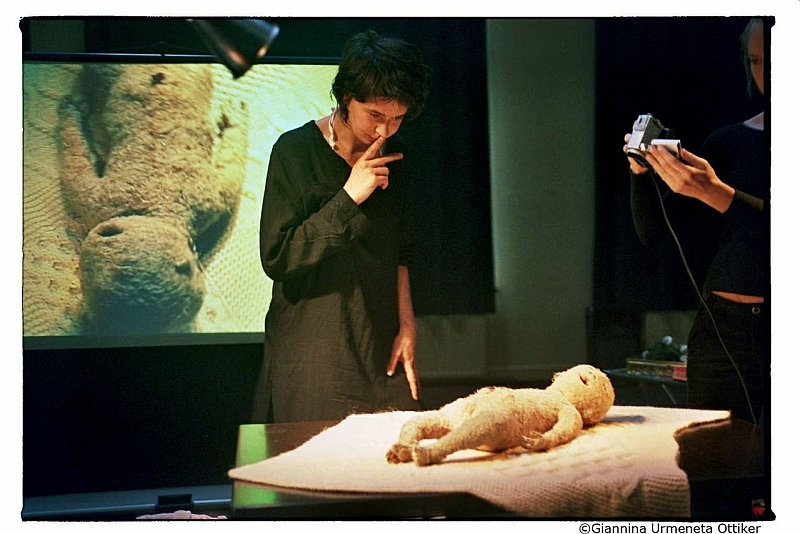 Excavations, was the beginning of the quest for the baby’s viability. 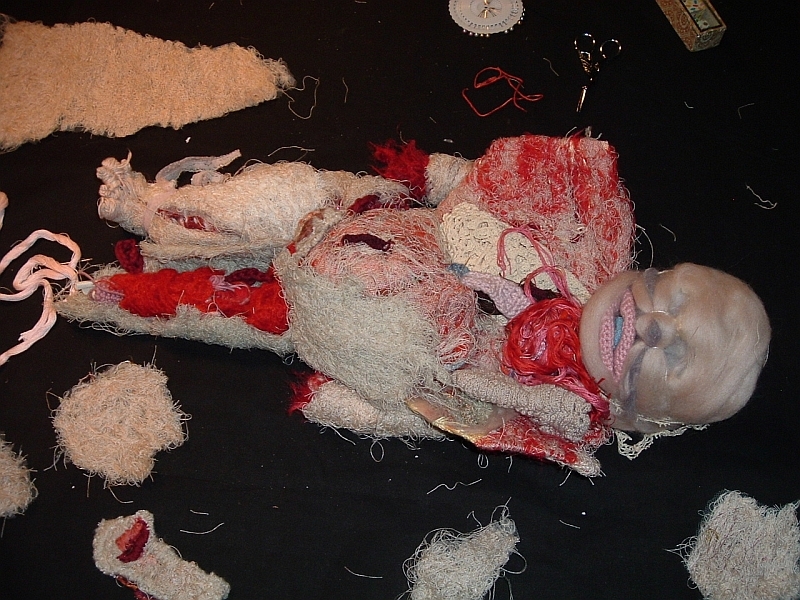 In the performance Marijs Boulogne revealed what had happened to the dead baby through an autopsy. Had it been alive at all? 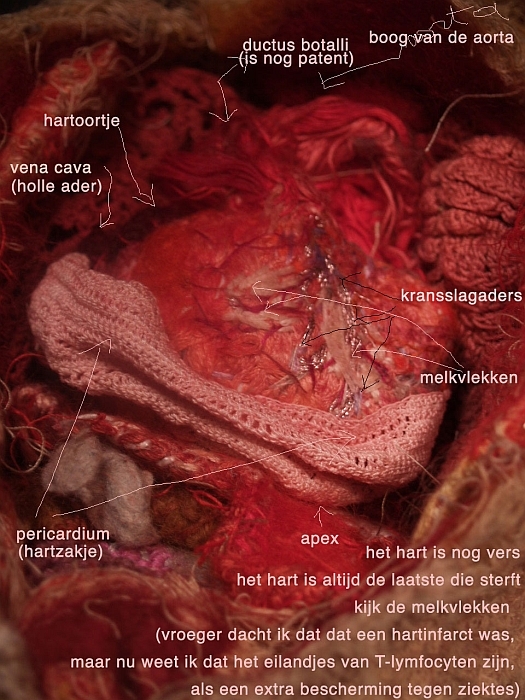 The audience got to witness, among other things, how the video artist Julia Clever used an endoscope to get a closer look at the baby's (crocheted, naturalist) innards. On the body there were no traces of violence or disease to be found, but one could not say with certainty whether the baby had ever lived independently. Supported by: Stuk, Timefestival, Nieuwporttheater, nOna, Beursschouwburg and the Flemish community. On the corpuscle brown spots appeared that never had to be washed. Every day there were more caterpillars crawling around the body, and had to be born again as moths. 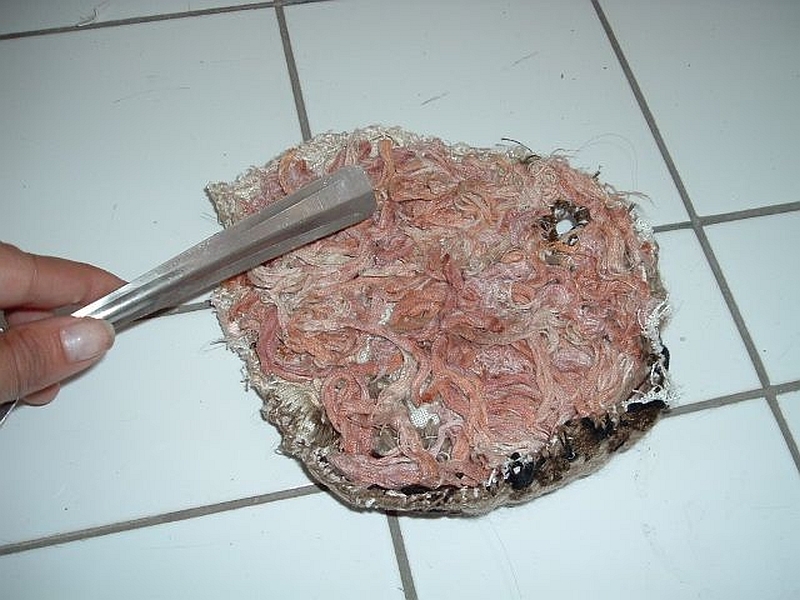 Every day the story was a bit longer, and so, finally, the baby descended from the Mother to rot and mold. Marijs had to make clothes for her newborn. Thanks to the storz endoscope sponsor, the embroidered baby could tour with a real endoscope. 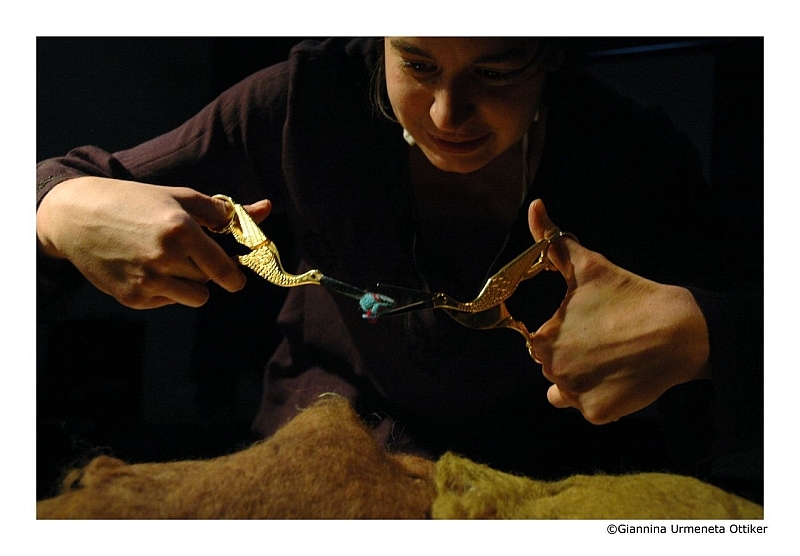 upon the invitation of time festival by the curator peter verhelst, a tryout and 8 performances were scheduled to take place in the cave in the gent city theatre. 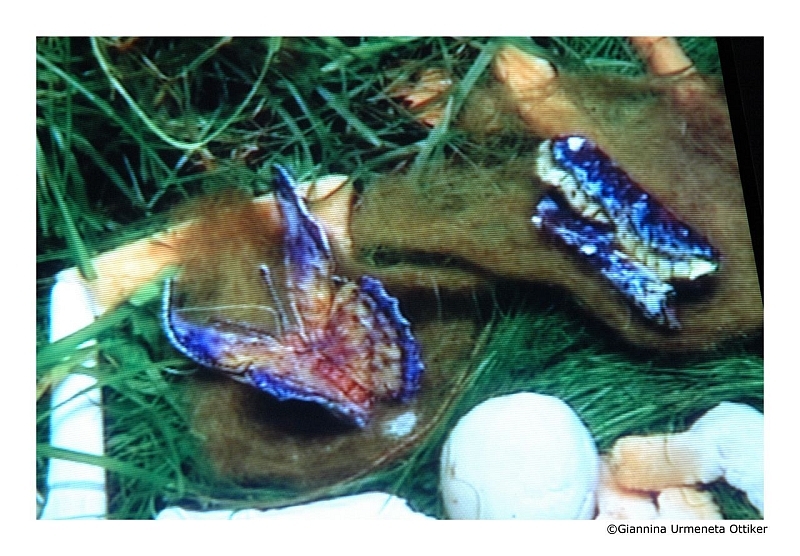 the rotting process with the collaboration of colourful fauna started to happen. 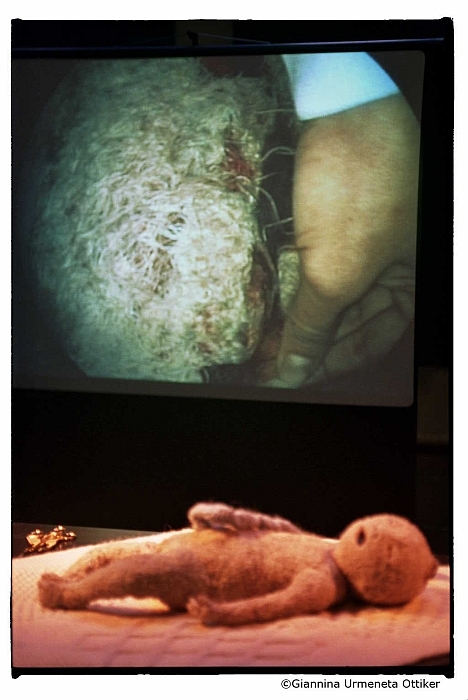 it was a glorious time of discovering the interplay of the endoscope with the embroidery. 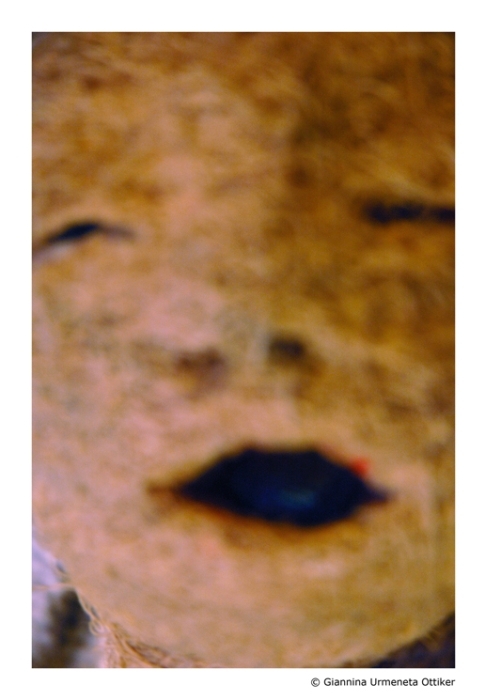 In Fresh but rotten, the fifth part of the Excavations series, Marijs plays the role of Mother Hein, who accompanies the corpuscle on its journey through various stages of decay. By highlighting the beauty of the decay processes, the artist wants to make the thought more powerful than death. She wants that dead child to demonstrate the miracle of life. Accompanied by Jim Denley, a composer for wind instruments, and a live filmmaker and endoscope visualiser Julia Clever, Marijs Boulogne plays a 50-minute performance, a goodbye ritual for her embroidered decomposing baby, together with live rose beetles and snails and caterpillars crocheted and embroidered by herself. 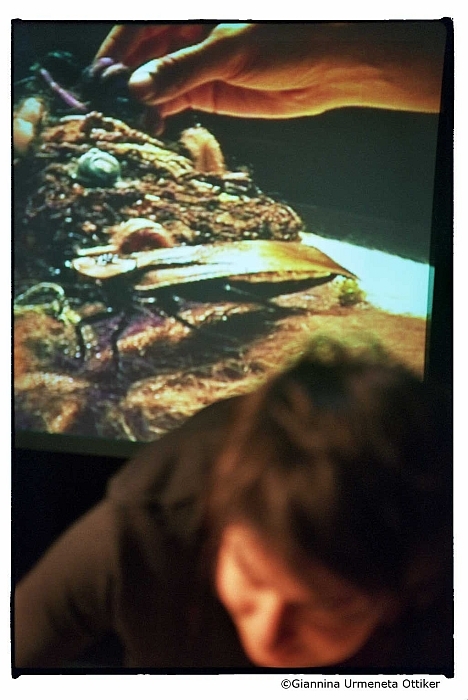 Drawing from videos of the work process and the performance with beetles, the solo in the Vooruit Art Centre (unfortunately performed with a broken foot) was an attempt to synthesize all former processes: Pregnancy, Fresh but rotten and Memories into a difficult solo, which later became The Anatomy Lesson. During the synthesis of Pas, a whole laboratory of new baby activities developed into an interactive workshop with the audience. The cast was enriched with local amateur actors and one could meet gods like the Bone Man and the Intestinal Tube Lady. A girl felt her own brains then they got lost mysteriously. Marijs receives extra coaching by Lotte Van Den Berg and her sister Jasmijn Van Den Berg. Production: Buelens Paulina vzw; supported by: Kaaitheater, Kc Stuk, Time Festival 2005, Kc nOna, Stad in Vrouwen-handen, Beursschouwburg, Vooruit, Huis aan de Werf Utrecht and the Ministry for the Flemish Community. 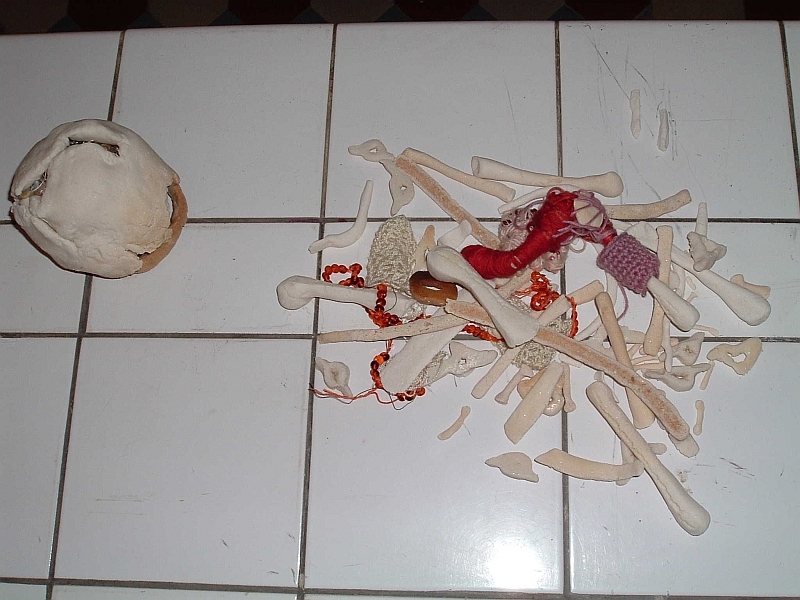 The Anatomy Lesson is the latest English language version of the third Excavations phase previously entitled Episcopia. More about this performance here .